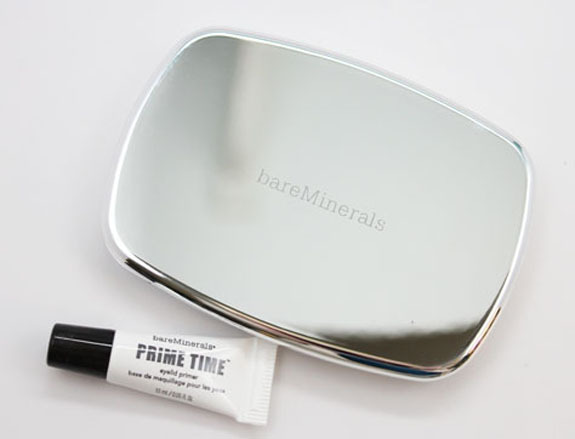 This holiday season bareMinerals wants YOU to have The Finer Things. 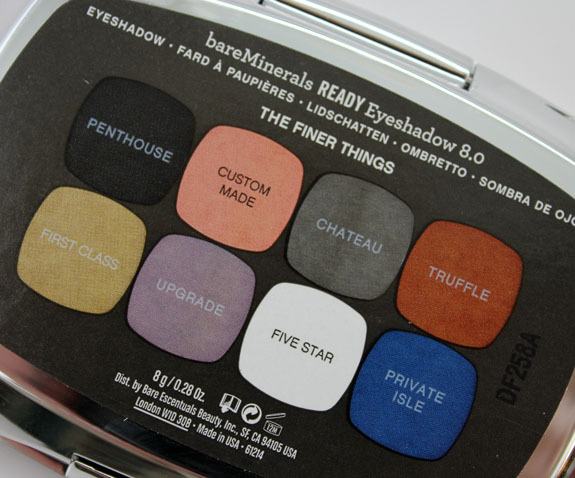 And The Finer Things just happens to be the name of their new Ready Eyeshadow 8.0 palette. 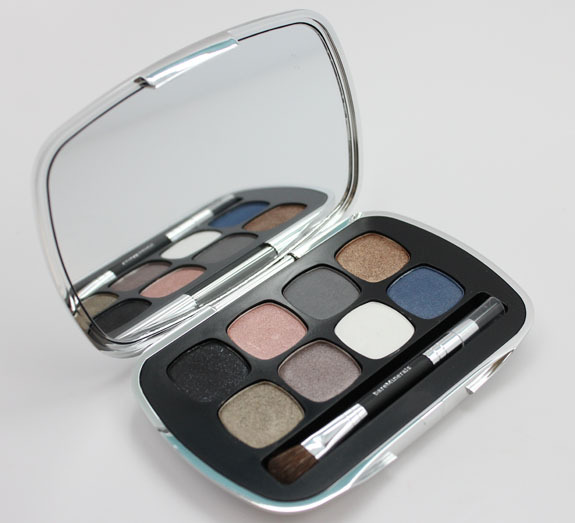 This palette features eight nicely pigmented eyeshadow, a large mirror inside, a dual-ended applicator brush and a mini Prime Time Eyelid Primer. I believe this is my first experience with bareMinerals eyeshadows and let me say right now I am really impressed with the texture and pigmentation of these. Most excellent! The shade names are all handily on the bottom of the palette. Penthouse is a jet black with silver glitter. I am so impressed with how amazingly pigmented and soft this shadow is! Custom Made is a metallic rose pink. Chateau is a medium dove grey with very slight sheen but mostly matte looking. Great shade. Truffle is a medium metallic bronze. First Class is a medium greenish gold/taupe metallic. Very unusual shade, I like it. Upgrade is a deep plum/taupe with shimmer. Another kind of unusual but pretty one. Five Star is a very bright and opaque white matte. Great texture. Private Isle is a medium/deep shimmery navy blue. It has slight golden shimmer and really nicely pigmented. Overall: Impressive! I really loved the super soft blendable texture these shadows have. All of them were pigmented and pretty. I love when I can use every color in a palette and they feel like quality shadows. No chalky sheer shades here! Pricing: $40.00 for 0.28 oz. Have you tried bareMinerals eyeshadows? Does this palette look interesting to you? Note: bareMinerals is cruelty free. I love how these shades swatch on you! 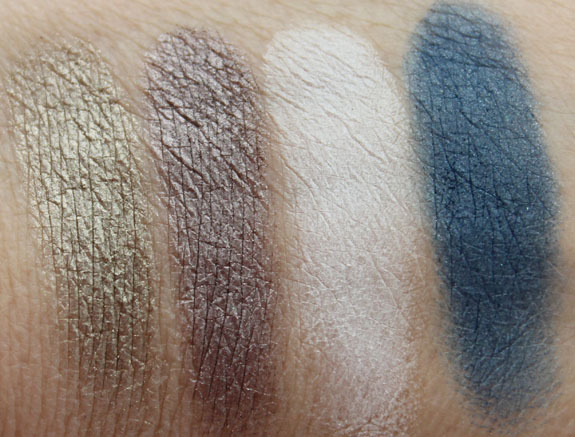 I have tried one of their Primer Shadows (Urban Nature) and it’s really awesome! Keep thinking I should grab a duo or a quad too! Sunny´s last post…Who Says Holiday Should Be All about Red? Guerlain Lou-Ling Shine Automatique & Nail Lacquer Beg to Differ! I have Urban Nature and love it, too. Thx! I am so pleased with them! I have 2 duos, a quad on the way, and an 8 pan that was part of last year’s holiday collection. I think they started doing their pressed powders a little over a year ago. They did a good job, I think. I haven’t tried these yet, but may have to with this set! SwatchedNails´s last post…Right or Wrong? It’s a good one to start out with I think! I really like their READY shadows, and being a loose shadow fan, I wanted to hate them. I have a ton of sets from QVC now and I reach for them more than anything. Plus it never seems like I am using much for good color payoff! I haven’t looked at them on QVC. Do they have some good exclusives? The eyeshadows look gorgeous! Although I’m not sure how I would combine the in a look. Do you like the primer? The primer is good but not as good as Too Faced Shadow Insurance in my book. Doesn’t last quite as long on me. Hi Kelly, those are sure pretty eyeshadows. Thank you for posting the pioneer woman pumpkin pie, I am using the crust recipe : ) I liked the looks of the filling too but the husband likes traditional style filling, so this should be interesting! lovenailpolish´s last post…Happy Thanksgiving Holiday, Now Let’s Shop! I haven’t tried these yet, but every review I’ve read is glowing! The older palettes are on sale at BE right now, I should pick one up. I’m not a fan of the loose pigments they make but these Ready shadows are great. I bought one set during Sephora VIB and the colors are amazing. 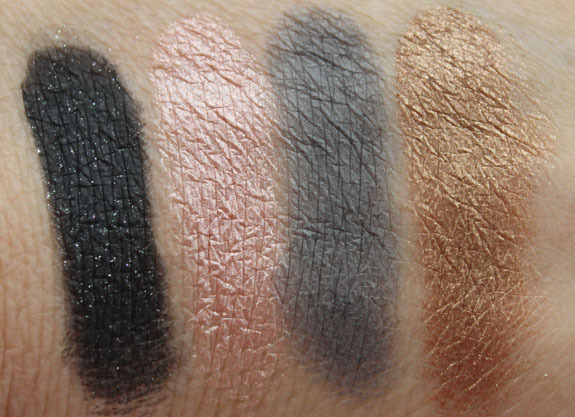 There are a few shades you swatched that I’d love – Truffle, First Class and Upgrade! Private isle looks awesome ! Gorgeous colours! I love the Penthouse shade. It’s perfect for creating smoky eyes for evening. HA HA “most excellent” I don’t know why that makes me giggle :). Anyway, YES this is a must have for me, First Class and Upgrade seal the deal for me. Even Penthouse looks super gorgeous and I never get excited about black!